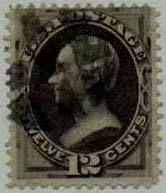 The Scott #140 is quite rare and is usually bought and sold with a certificate of authenticity. 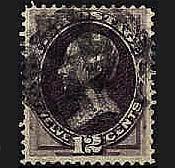 Obviously the seller schuylerac again found a rarity in that the original seller missed the grill on the stamp. NOT! Once again either "chickfrdstk" or "schuylerac" added a phony grill and damaged another stamp. Uuuuggghh! See more of their fake grills here.